A detailed guide to the changing landscape of cryptocurrency and the cannabis industry. Recent years have seen the expansion of the marijuana and cryptocurrency markets. For consumers, both worlds offer exciting new freedom in markets that were previously full of restrictions. These days, a growing number of people find themselves able to legally purchase marijuana. In addition to this, they can spend and invest in currency that’s free of governmental banking restrictions and privacy concerns. For investors, both markets feature some degree of legal uncertainty and high risk combined with the potential for huge rewards. With the cannabis market and the crypto world growing in size and recognized legitimacy, it seemed only a matter of time before marijuana and cryptocurrency would come together. Now that they have, cannabis and cryptocurrency is driving a part of the modern economy that’s fast-paced and ever-changing. Many feel that legal cannabis and cryptocurrency are two complementary movements in the modern economy. Cryptocurrency is a peer-to-peer digital currency system. It’s based on a decentralized network known as a blockchain. The decentralized nature of the platform makes cryptocurrency transactions free of the steep fees and regulations placed on transactions conducted via traditional financial institutions. 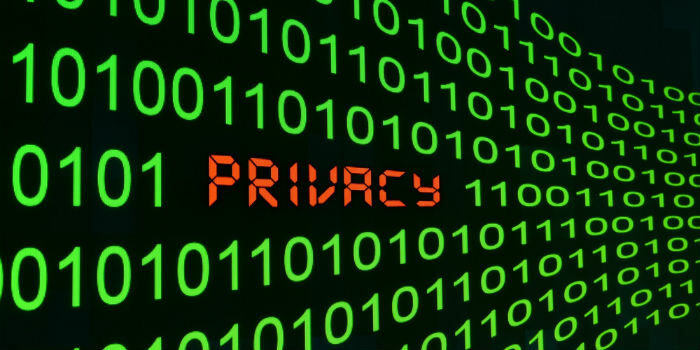 The three main tenants of cryptocurrency are confidentiality, integrity, and authentication. This means that crypto transactions can’t be traced or understood by anyone besides the parties involved, the transaction information can’t be altered in any way, and the sender and receiver can easily confirm the transaction between one another. There are no intermediaries in cryptocurrency as there are when using traditional banking and payment methods. This means that there are no restrictions governing when, where, or how the currency can be used. Consumers can use cryptocurrency to purchase everything from gift cards and software to more illicit items or favors. The latter has made the platform just as controversial as it is celebrated. Like the cryptocurrency world, the legal cannabis market has also been expanding despite the heavy controversy surrounding it. Medical marijuana programs are available in more states and countries than ever before, and legal recreational marijuana is being approved in a growing number of places, as well. Proponents of legal cannabis celebrate this as a step forward for personal freedom. Some people argue that a combination of cannabis and cryptocurrency creates even more flexibility and freedom. There are a several reasons why cryptocurrency advocates feel the two worlds are a perfect fit. One of the biggest factors that has brought marijuana and cryptocurrency together is federal cannabis prohibition in the United States. Within states that have legalized medical and/or recreational marijuana, any retail transaction that involves a debit or credit card would be processed through a financial institution that must abide by federal law. Because of this, many banks are hesitant to establish any sort of relationship with businesses in the marijuana industry, as marijuana is still considered illegal by the U.S. federal government. Because marijuana dispensaries are excluded from relationships with banks, they are forced to deal exclusively in cash. This creates multiple levels of difficulty. First, dispensaries must handle large amounts of cash on a daily basis – sometimes tens of thousands of dollars. This makes dispensaries potential targets of thieves hoping to hit an easy and lucrative target. Only being able to deal in cash also creates problems around tax time. Some dispensary owners must drive with huge amounts of money for hours in order to pay taxes in cash at their state’s IRS office. Despite marijuana being illegal at the federal level, cannabis businesses still pay taxes on the money they make (in 2018, it was estimated that marijuana businesses paid $2.8 billion in federal taxes). Until federal law changes, a large amount of this money will be paid in cash. Cash-only transactions at U.S. marijuana dispensaries are also inconvenient for many customers. At a typical retail operation, only 32% of all transactions are completed using cash. Because the majority of people prefer debit and credit cards, this can cause problems when first-time marijuana dispensary customers are caught unaware. Some dispensaries have installed ATMs for their customers’ convenience, but crypto proponents argue that a shift to traditional or marijuana cryptocurrency would greatly lessen the need for cash. Besides banking restrictions, privacy is most-cited argument for bringing marijuana and cryptocurrency together. Some cannabis consumers have expressed concerns over their credit and debit card transactions being tracked – whether they’re used to purchase marijuana in a Canadian dispensary or to order cannabis seeds from an online seed shop. Many people fear that such information could be obtained by insurance companies, used by U.S. border officials to deny entry to persons who have broken federal law by purchasing cannabis, or otherwise be “weaponized” against individuals. Because cryptocurrency transactions are anonymous, this means that marijuana cryptocurrency transactions can’t be tracked back to a specific person – a factor that makes cryptocurrency all the more attractive to the cannabis industry. Proponents of bringing marijuana and cryptocurrency together cite protection of privacy as one of the biggest benefits. One of the most interesting facets of cryptocurrency is that there isn’t just one form of it; people are free to choose whatever type of cryptocurrency they’d like to trade in, just as businesses are free to choose what kind of cryptocurrency they’d like to accept. Among all the traditional forms of cryptocurrency that have emerged, there are also “marijuana coins” that have been developed specifically to be used for cannabis-related transactions. Over the years, the various coins have battled it out for cryptocurrency supremacy. 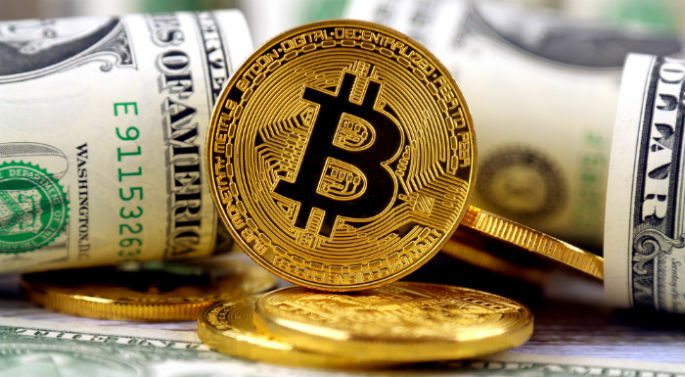 Ever since Bitcoin was first released in 2008, there has been a steady stream of different forms of cryptocurrency, but only a few have been strong and long-lasting enough to rise to the top of the pack. Bitcoin is the most popular form of cryptocurrency accepted at cannabis establishments – from online seed stores to headshops. The original (and most popular) form of cryptocurrency, Bitcoin (ticker symbol BTC) kicked off in 2008 when an anonymous person writing under the pseudonym Satoshi Nakamoto published a paper titled “Bitcoin: A Peer-to-Peer Electronic Cash System” to a cryptography mailing list. By 2009, a single bitcoin was worth less than one-tenth of one cent, but the next several years would see the value skyrocket as high as $20,000. After surviving countless attacks and never-ending controversy, Bitcoin has grown into the most reputable and resilient of the cryptocurrencies. When it comes to cannabis and cryptocurrency, Bitcoin is the payment option most frequently found in online marijuana seed shops, dispensaries, and other retailers who accept cryptocurrency. For transactions in brick-and-mortar stores, Bitcoin ATMs allow users to buy bitcoins or exchange them for cash. Based on a different blockchain technology than Bitcoin, Ethereum (ticker symbol ETH) was originally proposed by cryptocurrency programmer and researcher Vitalik Buterin and went live in July 2015. While Bitcoin was introduced as an alternative to traditional currency, Ethereum is dedicated to facilitating peer-to-peer contracts and applications. Since its inception, Ethereum has become the largest cryptocurrency in the world next to Bitcoin. Ethereum currency (known as Ether) reached a high of $1,400 in 2017, but by the fall of 2018, had fallen to $200. 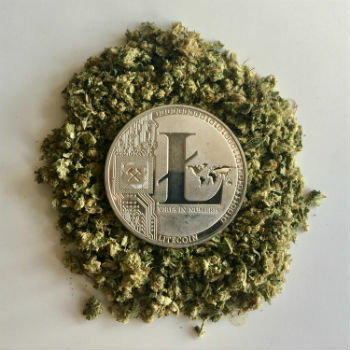 Developed to complement Bitcoin, Litecoin is also accepted at a variety of cannabis-related businesses. Another popular form of cryptocurrency, Litecoin (ticker symbol LTC) is one of the oldest cryptocurrencies in circulation after Bitcoin. Litecoin was released in 2011 by Google employee and former Coinbase Engineering Director Charlie Lee. Litecoin was designed as a complement to Bitcoin in hopes of correcting issues such as concentrated mining pools, as well as transaction fees and times. 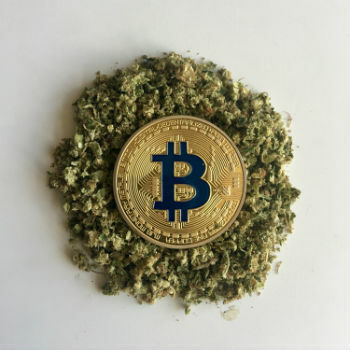 In time, cryptocurrency developers began to dream of a sort of cannabis Bitcoin – a type of cryptocurrency that would be adopted as the standard form of payment for marijuana businesses throughout the world. Out of this vision has come various cannabis cryptocurrencies – some with more staying power than others. 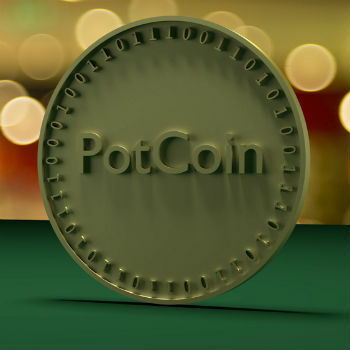 PotCoin has emerged as one of the most popular “marijuana coins” in the cryptocurrency market. Operating under the ticker symbol POT, PotCoin was released at 4:20 p.m. on January 21, 2014. The exact time of its release was no coincidence; the Canadian entrepreneurs who founded it (operating under the nicknames Hasoshi, Mr. Jones, and Smokemon 514) intended Potcoin to become the marijuana cryptocurrency of choice across the globe. Since its inception, PotCoin has become one of the most popular marijuana cryptocurrencies. Notable moments in PotCoin history include its reaching an all-time high market capitalization of $1,860,000 in July 2014. In June of 2018, former basketball star Dennis Rodman caused a buzz when he showed up at a Singapore summit between U.S. President Donald Trump and North Korean Leader Kim Jong-un wearing a PotCoin T-shirt. This was Rodman’s second North Korean visit sponsored by the cannabis cryptocurrency; his first PotCoin-paid trip took place one year before. Operating under the ticker CANN, CannabisCoin sprang into being a few months after PotCoin in 2014. Since then, it’s become one of the top cannabis cryptocurrencies on the market. CannabisCoin was created with a specific focus on making transactions easier within the medical marijuana industry. Developers of the platform crafted the idea of “CANNdy:” medical marijuana strains that would be donated by dispensaries and shop owners as a way to show appreciation for their customers. The donated products would go into “CANNdy” inventory and be available at one gram of medication for one CannabisCoin. This proposition has differentiated CannabisCoin from many other marijuana cryptocurrencies that are available. Created by Adam “Dopey” Howell in February 2014, DopeCoin (ticker symbol DOPE) was created to afford marijuana enthusiasts with a modern and secure way of purchasing (and receiving payment for) cannabis-related products. While other cannabis cryptocurrencies focus primarily on the legal marijuana market, DopeCoin’s founder has been upfront about the fact that DopeCoin will also be used by consumers buying from the black market. There are 200 million DopeCoins in existence, with over 117 million of them already in circulation. HempCoin (ticker code THC) was created in 2014 as a payment solution for businesses in the legal cannabis, as well as the agriculture, hemp, and tobacco industries. HempCoin’s vision is to be the go-to cannabis cryptocurrency available to be used for online purchases as well as in-person transactions via card terminals and point-of-sale systems. Despite the potential benefits of shifting to Bitcoin or some type of marijuana coin for cannabis purchases, dispensaries have been slow to adopt cryptocurrency as a form of payment. Strangely, this is due in part to the rules of a banking system that has largely pushed dispensaries out. 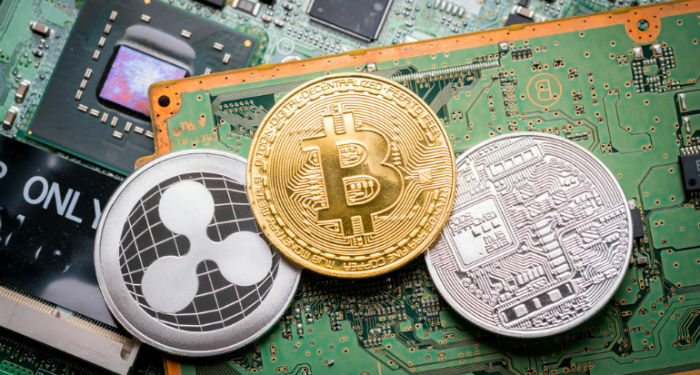 Many business owners are also hesitant to jump into a cryptocurrency market that’s constantly changing – especially when it comes to lesser-known coins. Cannabis dispensaries find themselves in a legal gray area when it comes to state vs. federal laws. Even so, most of them try hard to abide by federal and state tax and regulatory reporting requirements. Some dispensaries that have limited banking relationships say that those relationships would be severed if they started utilizing any sort of a cashless currency. Especially given that financial regulators are unclear about how to classify cryptocurrency, dispensary owners worry that introducing it could invite federal scrutiny, as well as potentially muddy the waters of required seed-to-sale record keeping. Another factor that makes some businesses hesitant to adopt cryptocurrency – and especially lesser-known forms of it – is the rate of change within the crypto industry. One factor is cryptocurrency volatility; the value of any given cryptocurrency can fluctuate wildly throughout even a single day. This causes online retailers to offer a limited window of time (10 minutes, for example) in which a certain amount of Bitcoin, for example, must be transferred in order to pay for a shopping cart order. While cryptocurrencies of all types – including marijuana coins – are growing in popularity, this doesn’t mean that they all have staying power once they hit the crypto market. Düber coin is one such currency. The tokens were announced in 2017 as cannabis crypto that would revolutionize the marijuana industry. Düber tokens could be earned by sharing information (reviews, brand referrals, contributing content), as well as for purchasing from participating retailers. Unfortunately, as of the publication date of this article, the Düber coin website has disappeared, as has any current mention of the tokens themselves. Cryptocurrencies such as Coinye and BitConnect, among many others, have suffered similar fates. While Bitcoin, Litecoin, and others have had staying power, marijuana business owners are leery of lesser-known cryptocurrencies that may soon disappear. Marijuana and Cryptocurrency: The Economy of the Future? On the surface, the cannabis and cryptocurrency markets look quite different. One operates in the sale of a long-prohibited plant, its concentrates, and the tools required to grow and consume it. The other is focused on offering a method of currency that’s free from the restrictions and regulations placed on government-backed currencies. Despite their differences, however, the marijuana and cryptocurrency markets also have quite a bit in common. Both of them operate in regulatory gray areas and proponents of both are fighting for legitimacy. Cryptocurrency and legal marijuana are also both moving into the mainstream and being embraced by a growing number of people. Many cryptocurrency proponents believe that the anonymity and lack of regulation offered by platforms like Bitcoin, as well as marijuana coins such as PotCoin and CannabisCoin can solve some of the financial hurdles being faced by businesses in the marijuana industry. Only time will tell whether dispensaries and other cannabis-related businesses will embrace cryptocurrency, wait to be allowed into traditional banking relationships, or even perhaps opt for both crypto and traditional payment methods to provide greater flexibility to their customers.